Disclaimer: Fini Cutlery provided me a free 8" chef's knife to test for this review. That said, I will always review products truthfully and share my real thoughts. About a week ago I mentioned in a tweet that I was lucky enough to get my hands on an early version of a Fini Cutlery Knife to test out. Now that I've had more time to use it I wanted to write a full review. Fini Cutlery is one of the new breed of knife companies that instead of just tweaking the appearance of knives are reassessing the entire knife from tip to heel. I have seen several knives do this lately, including the NextGen San Sebastian ergonomic knife I reviewed, and they all attack this problem in a different way. Fini Cutlery takes the novel approach of removing most of the handle, resulting in a better "chef balanced" knife. Or as they like to say "Less handle. More control." The whole Fini premise depends on cooks who hold their knife "properly", in the traditional chef's style pinch or blade grip. In case you are unfamiliar with this style, Fini explains it in their video or you can check out this Serious Eats article on it. My first thought when I saw the knife was "how the heck will this be comfortable?!?" It just looked so different with its little handle. Though as soon as I picked it up it slid right into my grip and felt great. It has a really good balance and feels comfortable and sleek. I very quickly got used to the shorter handle. One benefit of the shorter handle is that when you are rock chopping you have a wide range of movement and it rocks much more easily than many of my knives. The shorter handle and different balance also allowed for easier maneuverability, such as when cutting around bell peppers or bones in meat. I felt like I was leading with the knife, vs trying to work around it. I only missed the handle once, and that was when I was dicing cheese for an omelet. The smaller handle leaves less room to apply force to get through the cheese. This is less of a gripe and more to illustrate that it worked great on everything else I used it on, from meat and veggies to herbs and tomatoes. The only time the different balance of the Fini knife was a negative was during cleaning and non-cutting maneuvering. Because the balance of the knife is different, it handles differently when you aren't cutting with it. It is a minor issue, and one that will go away with more use, but it was enough that when I was hurrying to put my knives away I did nick myself with the blade. But hey, you can't say the knife isn't sharp! The knives are made of the high-quality German Steel 4116 that is common in many German knives (which fits around the price point of these knives). The knife was very sharp and held its edge well, with the metal having a nice feel and heft to it. One of my biggest issues with buying knives online is that the feel of a knife can be very personal and it's hard to determine if it'll work for you unless you actually hold it. 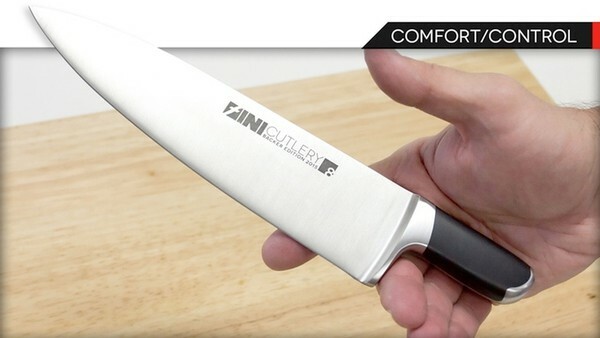 I was pleasantly surprised that Fini is offering a "Get a Grip" offer to their Kickstarter backers that you can use the knives for 3 months and if you don't like the feel of them you can return them for a full refund. The knives are also reasonably priced. Their 8" chef's knife is only $55 ($20 off) and their 5-piece set is just $195, which is about $130 off. They've already met their funding goal of $45,000 (they've raised $50,000 so far) but their Kickstarter campaign is still going for another week or so if you are interested. The Fini knife will definitely be giving my existing 8" chef's knife a run for its money as my main knife!